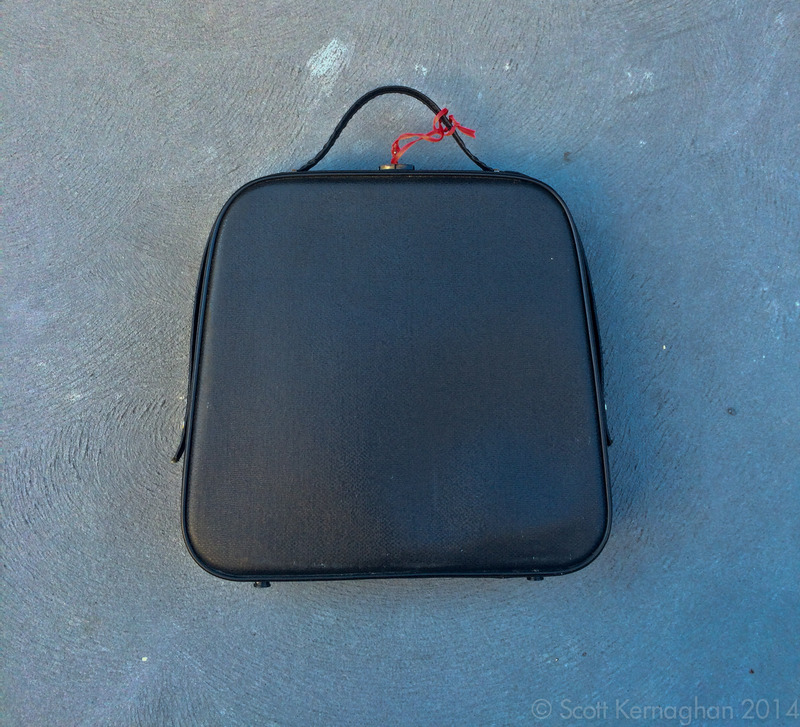 Recently, Nick from X Over it featured on his blog a typewriter with an interesting case that had a handle that could extend out and become a shoulder strap – a convertible handbag if you will – that held a Consul 235 typewriter. These are interesting little machines, and I’ve been wanting to get my hands on one for a while. 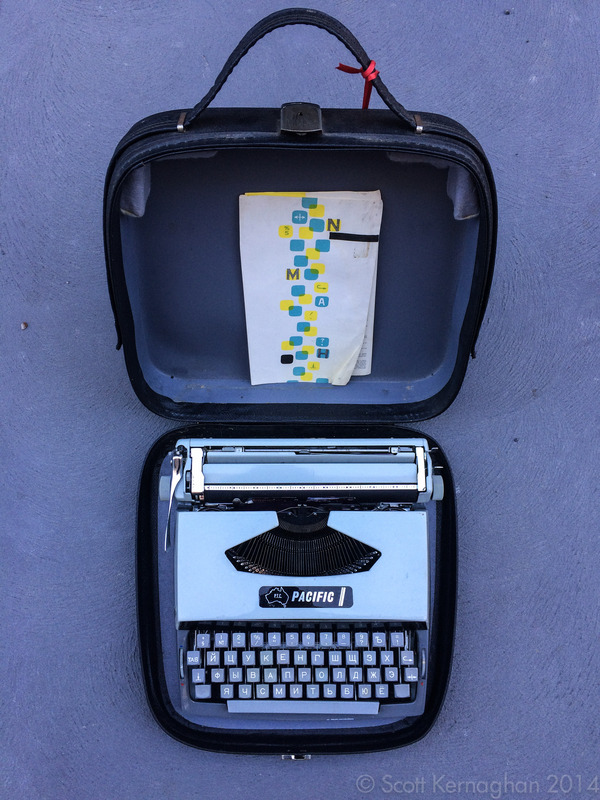 I haven’t had a time to work on typewriters much lately, and this was a little bit of a self-indulgence purchase that I just… well, didn’t really think about making and just bought. Sure, I could have used the time to work on an online typewriter project that I have neglected for a month or so (I’ll get back to that really soon) – but this interesting little machine came by at a time when I urgently needed a nice little distraction from the onslaught of work I have been facing. When I say interesting, I should say unique. There’s a few things about this typewriter that are rather contradictory, and I found the machine utterly fascinating. It isn’t actually branded a ‘Consul’, but rather has been branded for the Australian market as a Pacific. Pacific typewriters were also marketed in other parts of the world, however locally these had a big-arsed outline of Australia on it’s logo so that you knew absolutely for sure that it was for the local market. It was bit of Aussie pride bait. 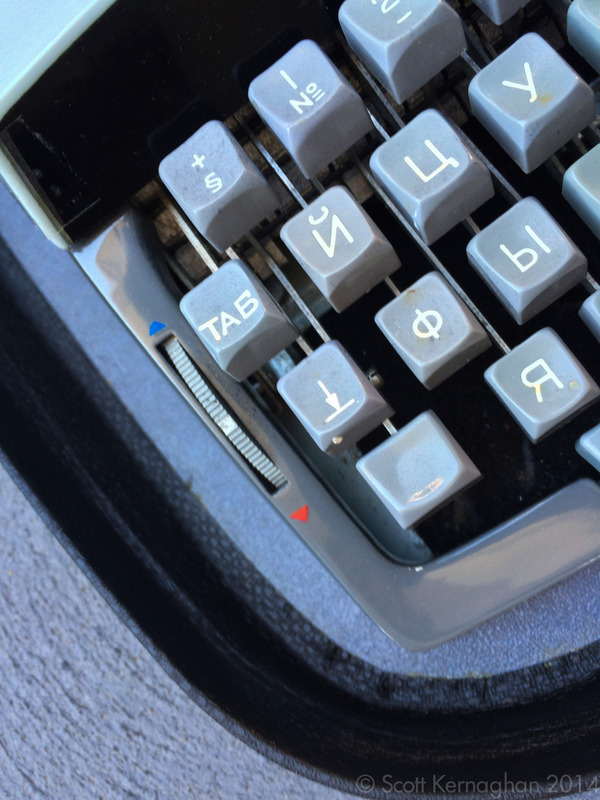 Which is what makes the next fact about this typewriter so unusual; It has been endowed with a Cyrillic (often referred to as Russian) typeface. This isn’t the first cyrillic machine that I have bought, and unlike the other one which is also full of contradictions I actually know the story behind this one. It’s pretty simple really, the daughter of the original owner sold this typewriter to me, and she told me about how her Russian immigrant father bought it in the 70’s for himself and was a special request to the Pacific Typewriter Company. He used it to write letters to family back in the old country, but had a second typewriter for his work – which was with a local community newspaper. I’ve got to hand it to him though. He would have purchased this machine at a time when the cold war and fear of the soviets was still at an all time high. 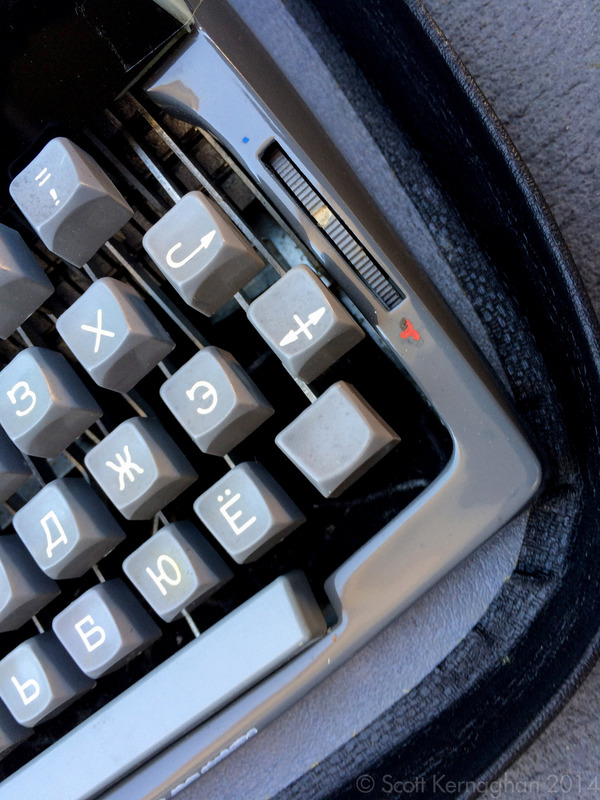 I couldn’t imagine walking into a shop and saying ‘can I have a Russian typewriter’? 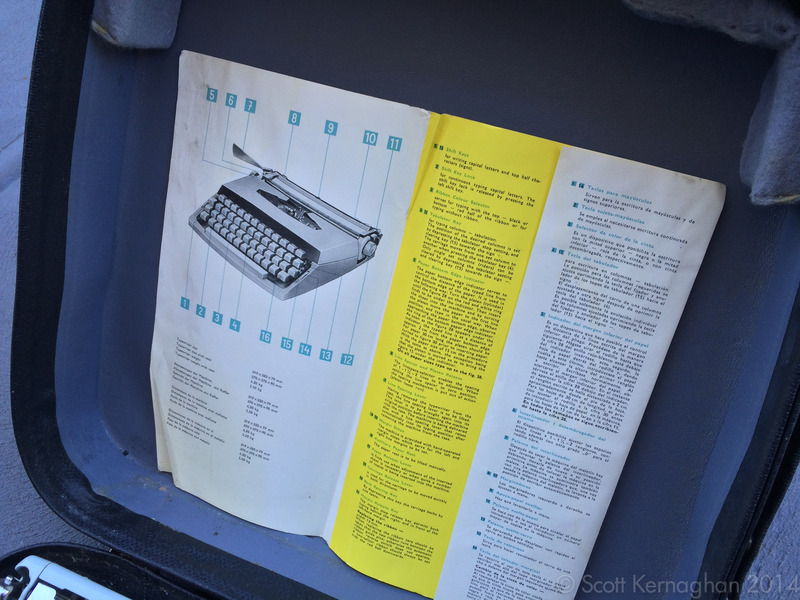 The typewriter also came with its original Manual, which has multiple languages featured in it. This machine was clearly designed as an export typewriter that could be re-branded to suite any potential buyers. The manual itself remains totally devoid of any branding. The typewriter is made from steel and features only plastic on its keys and dials. It is light and responsive to type on, and is largely very comfortable. That said, the controls on this machine are not immediately obvious in their function, and in a poor design choice use blue and red repeatedly. This is obviously to keep the design looking balanced, however it leaves you scratching your head as to which of these controls could be touch, tab or colour selection. Perhaps I should just go and read the manual. The sellers of this machine were delightful people though. They had a beautiful house filled with Art Deco furniture that just made it look stylish and cool. The kind of gear I’d love throughout my house. “Old things just have more feeling to them” the seller told me as I walked to the door “I couldn’t live in a house filled with modern furniture”. Right on, sister! As for the typewriter everything about this machine speaks volumes about the multicultural nature of Melbourne which has a large and mixed population that are just as proud of their cultures as they are diverse. Now… I need to go an mow the lawn. Uuuuurg. I hate doing this in summer. 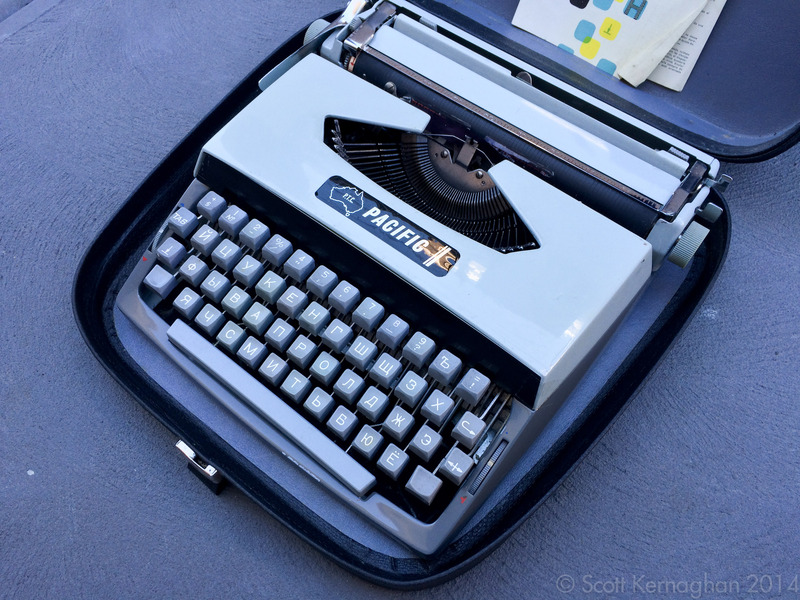 ← Selling typewriters and my hunt for the great white whale. Very cool machine! Thanks for sharing. Thanks Richard. It was a lovely little find. Yes coool! If ever a typewriter was a collector’s item that’s it! Interesting backstory as well. Write on Brother! Ha ha ha. Now all I need is a stronger Russian vocabulary. thanks for featuring this nice machine. 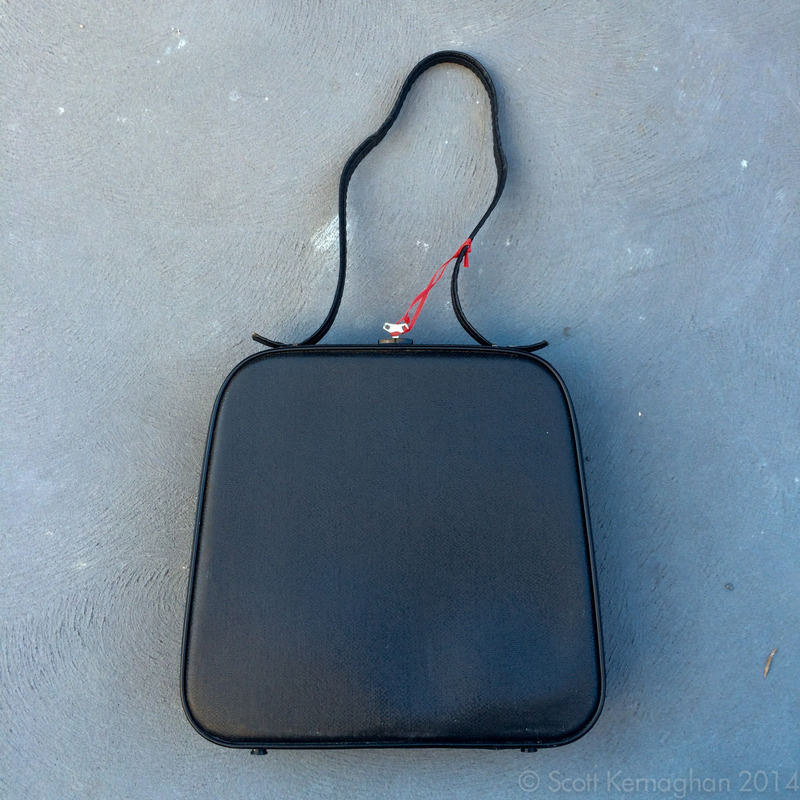 i have a couple of similar consuls, and it hadn’t occurred to me that the strap would extend! Scott, I can possible shed a little more light on the subject of the “Pacific” brand. Pacific Typewriters was a company owned by Joe Vaver who was a personal friend of mine for many years. Oh that’s interesting. John, is there any member of this guys family still alive? I noticed that there’s still a pacific typewriters australia listed as a business here in Melbourne. He had a daughter called Tanya, I believe that was her name. I spoke to her quite often.